The doctor is disappearing in America. 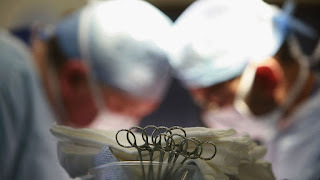 And by most projections, it’s only going to get worse — the U.S. could lose as many as 1 million doctors by 2025, according to a Association of American Medical Colleges report. 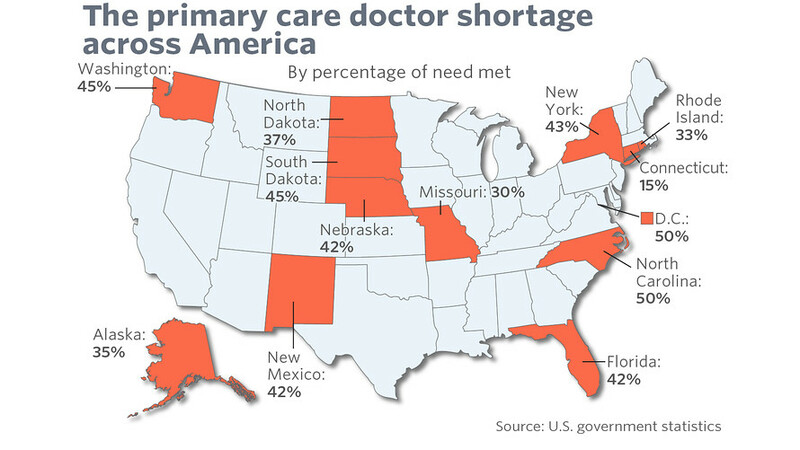 Primary-care physicians will account for as much as one-third of that shortage, meaning the doctor you likely interact with most often is also becoming much more difficult to see. Tasked with checkups and referring more complicated health problems to specialists, these doctors have the most consistent contact with a patient. But 65 million people live in what’s “essentially a primary-care desert,” said Phil Miller of the physician search firm Merritt Hawkins. Without those doctors, our medical system is “putting out forest fires — just treating the patients when they get really sick,” said Dr. Richard Olds, the chief executive officer of the Caribbean medical school St. George’s University, who is attempting to use his institution’s resources to help alleviate the shortage. 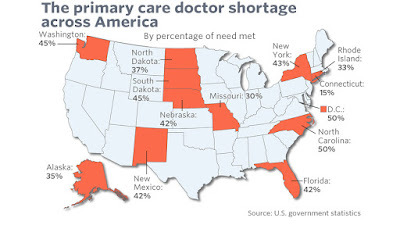 The primary-care gap is particularly acute in about one-third of states, which have only half or less of their primary-care needs being met. Connecticut is a standout among the group, at about 15%, with Missouri, at 30%; Rhode Island, at 33%; Alaska, with 35%; and North Dakota, at 37%, next on the list, according to government statistics.